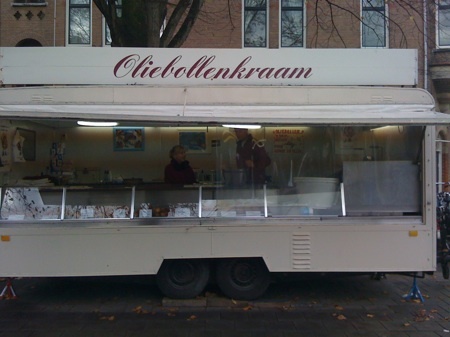 New Year’s Eve is approaching fast and the oliebollen street vendors have returned to the popular corners of Amsterdam to sell their greasy winter treats. 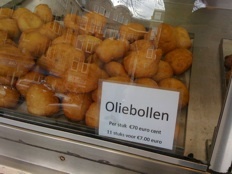 The Dutch love their oliebollen, which translates to oil balls. And for good reason. The balls are deep fried by the street vendors in their stalls and you will be sucked in by the sweet and greasy smell from far away. The dough is made mostly of eggs and flour, with some yeast, milk and baking powder to give the balls a fairly puffy texture. They are then deep fried golden brown and served warm. The plain variety is most common and usually garnished with vast amounts of powdered sugar that will be all over you when you take a good bite out of your oily goodness. 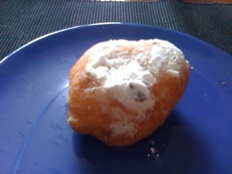 Olibollen with raisins are also popular. what are the weirdest variety available, ever? Looking forward to trying them.